Several years ago, Hugh and I started our new Thanksgiving tradition of adopting a turkey from Farm Sanctuary. We’ve always been urban dwellers, so adoption beyond our beautiful kitty isn’t an option. But, Farm Sanctuary offers remote adoptions of their rescued turkey folk. Although Farm Sanctuary has a reasonably high profile through their advocacy work and their shelters in both New York and California, if you haven’t heard about them and you have some interest in the welfare of farm animals, take a look at the beautiful things they do for domestic animals. According to Farm Sanctuary, between 250 and 300 million turkeys are killed each year for Thanksgiving celebrations. Adopting one rescued bird seems like the proverbial drop in the ocean. But as Hugh always likes to say, an individual act of kindness matters to that individual animal. Last year, our individual animal was Faye. I clicked the “choose for us” option and our Adopt-a-Turkey certificate arrived with Faye’s picture and a short description of her former life. She was rescued from a Northwest Airlines cargo disaster. 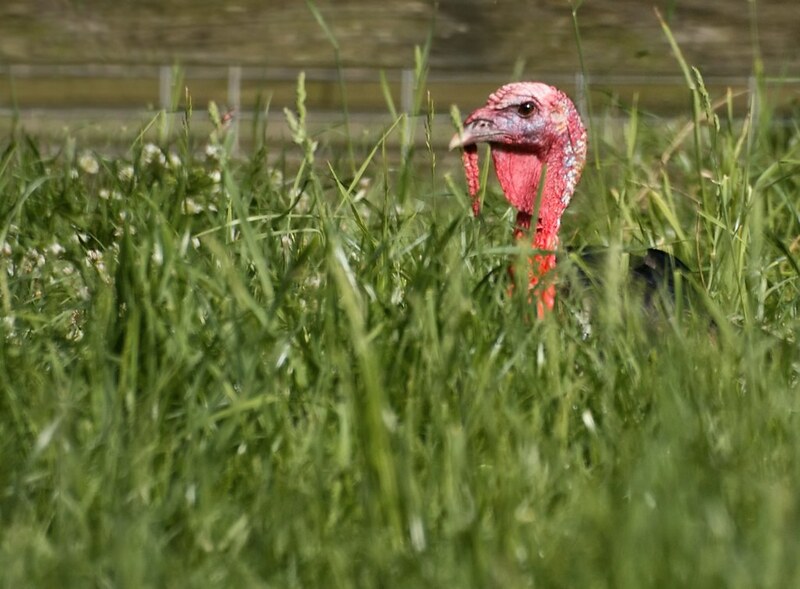 This year, it’s Hawthorn, a turkey found wandering outside a factory farm in Southern California. We’ve observed, over the years, a variety of alternative Thanksgiving celebrations, owing to our appreciation of turkeys and their many modern travails. But it wasn’t until we discovered Farm Sanctuary’s program that a consistent Thanksgiving ritual was born in our small household.